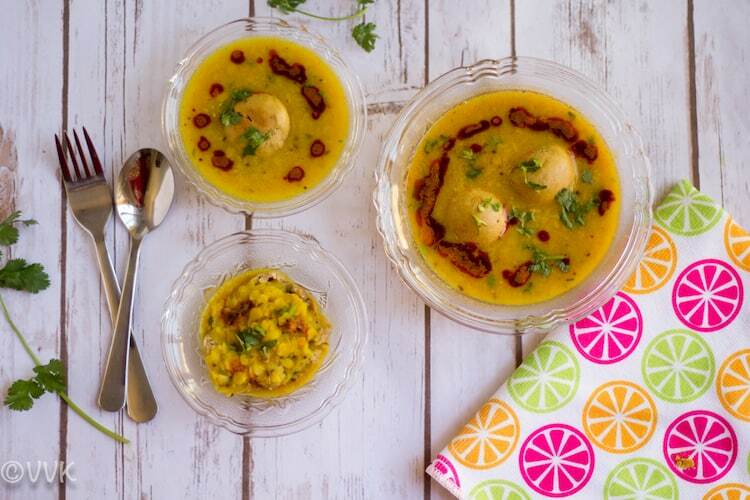 Earlier this year, I posted dal baati at IMC as part of the Toka Chef recipe. 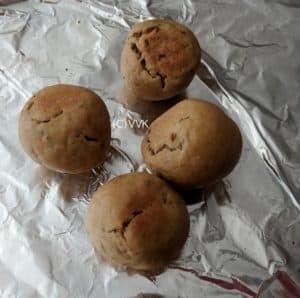 And when I was reading about the dal baati, I came across this dal bafla which is quite popular in Indore/Malwa regions of Madhya Pradesh and also litti from Bihar. When I was writing down my recipe list for this marathon, I didn’t think any further; I just wrote this dal bafla for MP. So what’s the difference between baati and bafla? For baati, we prepare the dough and bake them directly whereas for bafla we first boil them and then the baking. So baflas are comparatively softer than baatis. Also, dal baatis are commonly served with panchmeldal whereas for baflas the dal can be as simple as below. The Bihari litti is different from this baati and bafla. It’s a stuffed ball served with potato brinjal gravy. Dal bafla by itself is a filling meal. And if you add some veggies to the dal, you can make it into a balanced meal. As I included wheat and ghee, I cannot claim this as gluten-free and vegan, but I made this as no onion no garlic. I took the base recipe from here. I am yet to try these baflas with other gluten-free flours. You can replace ghee with oil or vegan butter. 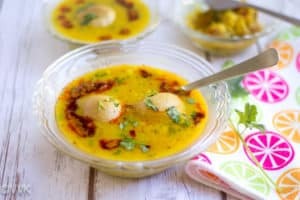 But I need to agree that, ghee does add a unique flavor to this dal. 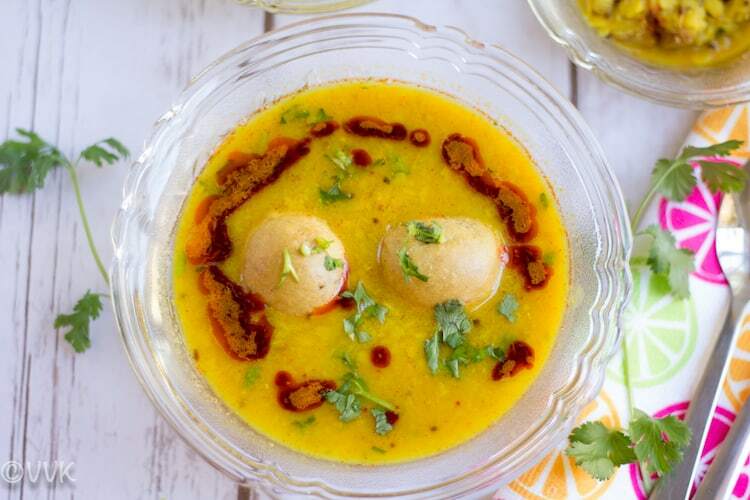 A traditional recipe from Madhya Pradesh This dish comprises bafla, the baked wheat balls, and the delicious dal. Usually, the cooked wheat balls are crumbled and served with dal and ghee on top. 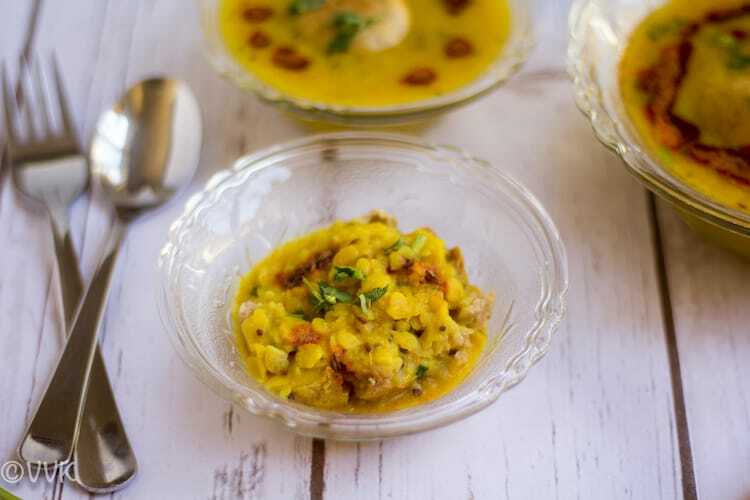 You can prepare the bafla first, and while you are baking it, you can make the dal. As I used, IP for both, I had to wait till the baflas are boiled. But if you are not using IP, you can prepare them all simultaneously. Else, bring 6 cups of water with ¼ tsp of turmeric and ¼ tsp of salt to boil in a wide vessel. Meanwhile, you can prepare the dough for the bafla. 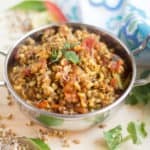 In a mixing bowl, combine the wheat flour, Juwar flour, ½ tsp of salt, ½ tsp of cumin seeds, ½ tsp of carom seeds and ghee. Now add water little by little and mix the ingredients to form a nice dough. I used about ½ cups + 1 tbsp of water. Divide the dough into equal sized balls. I just divided them into four medium-sized balls like below. Roll them in your palms and make it smoother. 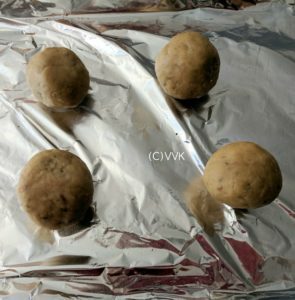 Once the water starts to boil, slowly drop these balls into the water and let it cook until they float to the surface. In IP it took me about 8 minutes. Carefully remove those balls and let it dry for at least 10 minutes. Make sure you drain the excess water. Meanwhile, preheat the oven to 350 deg F and also line a baking tray with parchment paper or aluminum foil. Place the bafla in the baking tray and bake for about 30 to 35 minutes until they are crisp and firm like below. Make sure you turn once in between. I baked for 32 minutes. While the baking is happening, you can prepare the dal. After baking, allow the bafla to cool before assembling. 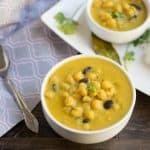 Add the washed toor dal, salt, turmeric powder and 1.5 cups of water in a pressure pan or cooker and cook for up to 3 to 4 whistles. Let the pressure drop and mash the dal nicely. 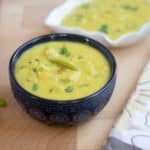 Add the washed toor dal, salt, turmeric powder and 1.5 cups of water to the instant pot (make sure you rinse it once after boiling the bafla) and set it manual mode and cook for 12 minutes. Let the pressure release naturally and mash the dal nicely. In a separate tempering pan, heat the ghee. Once the ghee is hot, reduce the heat and add mustard seeds, cumin seeds, hing and red chili powder. Make sure you cook this over a low flame to prevent the red chili powder from burning. Keep mixing this tempering and as the mustard seeds start to crackle, add it to the dal and mix it well. There are multiple ways to serve the bafla, but this is how I served. Usually, they don’t add the bafla directly to the dal, but I just added two like how we do for the south Indian lentil sambar / paruppu Kuzhambu. Take the bafla in a serving bowl and crush them. Drizzle some ghee. I added about one tsp of melted ghee. Then add a ladle full of dal on top. Make sure you drain the excess water off the baflas before baking. You can bake a higher temperature for lesser minutes. All we need is nice brown, firm bafla. So adjust the temperature and timing as per your preference. 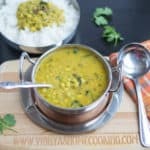 I went with simple dal version, but you can make your dal in your style be it with onion and garlic or with mixed dals. You can replace ¼ of Juwar flour with any favorite flour of your choice, or you can prepare the bafla entirely with wheat flour. Another new recipe today!! Havent heard of this bafla.. Sound very interesting. This is one such wholesome meal,looks delicious and very well presented. 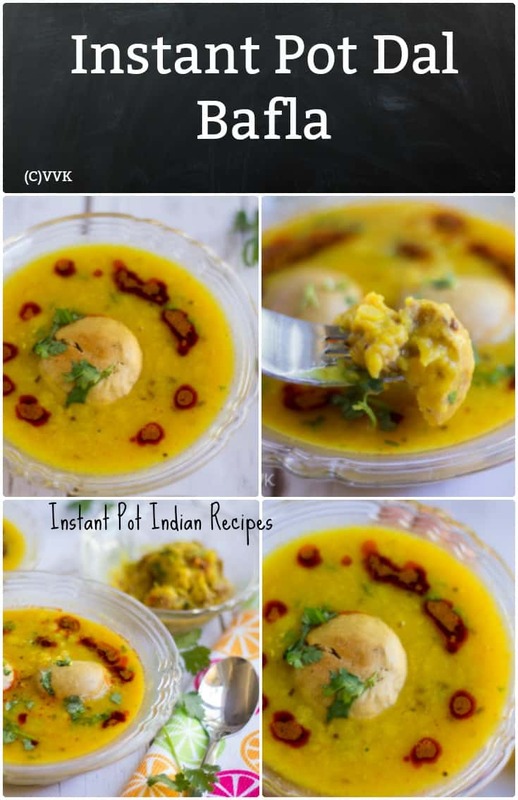 Love this one pot meal.. just like dal batti… bookmarked. 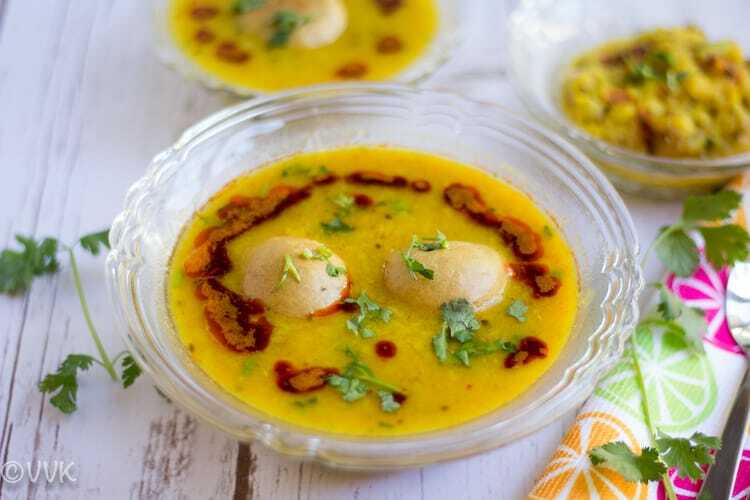 Daal bafla looks absolutely comforting, dunno why i just love this kind of dishes prepared with dal and wheat flour balls especially Dal baati. I wont say no if you serve me this ultimate dish. There are always different versions of a dish all around the country. This dal bafla looks very comforting. You make it sound so simple Srividhya. I have been looking at the recipe and avoiding it. Now this is something I will try. The pictures are so beautifully presented Srividhya..I have this bookmarked too ever since I read about it..such a lovely dish! This recipe is so interesting. I have made litti choka and loved it. I think I would love this too. Beautifully done and captured.. Thanks Gayathri. I am yet to try litti. Should give it a try soon. 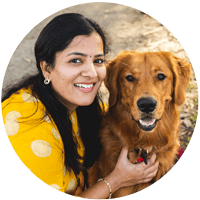 What an interesting recipe SriVidhya. I’ve tried both dal bhaati and litti chokha. Bookmarked this baffle recipe to try it out. oh wow. That’s awesome. Thanks Mayuri. Love your intro explaining the difference between the various dishes and a lovely pick for MP. Have never heard of this before…need to try it asap! Love the red chill seasoning.. It attracts me a lot. Perfect share..
Beautiful Presentation. This is a new recipe for me. Interesting!!! Ah what a beautiful choice ! Since long I have been wanting to try the Daal Bafla , but wonder why I haven’t ! 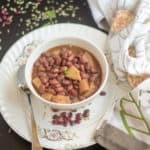 Really the clicks are amazing and a super recipe for this wholesome meal . Bookmarking to try it soon . Thanks a lot Vaishali. Glad you liked it. Wow love this Dal Bafla. So many childhood memories refreshed with this post. Thank you so much..